Freaky Smudge: Remember life before the Internet? Cuz I Don't! Hey Smudgers what's up! I know I owe you guys some posts and I'm sorry but my internet has been down :( I'm keeping this New Years Reezie if it kills me (touch wood!). So how has everyone been keeping??? So I've decided to go all super fit for Benicassim! Despite the fact that I stupidly bought diet pills, I highly doubt I'll take them. I found this 30 day programme online (http://imgur.com/gallery/FkVrO) which I will be repeating and have been following - so far so good! I've also completely changed my eating habits and have cut down my coffee intake (which has been more difficult than I care to admit..), my tea intake has increased dramatically due to this :P For breakfast every morning I've been eating porridge (which tastes 10 times better with soya milk, who knew!) and a banana, along with a cup of tea and those Vitamin C things that dissolve in water. Then I'll do what every workout I have to, stick an apple and a bottle of water in my bag and head out for the day :) At lunch I'll eat like soup/ tuna sandwich (I know salads are supposed to be all healthy and all, but I don't like how they can be smothered in salad dressing and I hate tomatoes!!). Then I'll walk home, depending on the day and weather, which takes an hour any way I go, and have a lovely chicken stir-fry (one chicken breast, an onion, greens, a carrot, seasoned with some thyme, black pepper and ginger :) ). I've been doing this for over a week now and according to the scales I've lose 8 pounds :) I hope that's accurate and the scales are functioning! So I'mma keep going and let ye all know how that goes! Who is this woman you ask? Well you can thank her for New York Fashion Week and the Council of Fashion Designers of America (CFDA). Eleanor Lambert was born on the 10th of August 1903 in Crawfordsville, Indiana. She studied sculpture and fashion at the Chicago Art Institute, earning herself a promising career. She moved to New York and started working for an advertising agency in Manhattan, dealing with artists and art galleries. Lambert was also involved in the founding of the Museum of Modern Art. She also assisted in setting up the American Art Dealers Association. Lambert saw fashion as an art form. 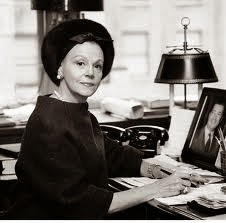 In the 1940's she set up the International Best Dressed List, the Coty Fashion Critics Award (1943), and organised the semi-annual Fashion Week in New York which allowed international and national designers to showcase their collections to the world, and which still runs today. She did the same for European fashion capitals. In 1962, she founded the Council of Fashion Designers of America (CFDA). In 2001 the Council created the 'Eleanor Lambert Award' presented for a unique contribution to the fashion world or deserves special recognition. A fortuneteller once told Eleanor Lambert that she would a live long life and know the most talented people of her era. Eleanor Lambert lived to be 100 years old; She died on the 7th of October 2003. Eleanor Lambert's contribution to the world of fashion was extraordinary - the achievements you see before are only a small segment of the work she did throughout her long life. Lambert saw the greatness in fashion and the events she founded will continue long into the future. Without her, the world of fashion would be limited and bare. Eleanor Lambert shaped the way the world views and experiences fashion.